Dark...err...horse, right here! 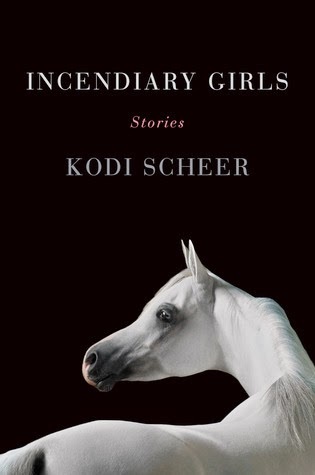 Incendiary Girls, by Kodi Scheer, is a book I'd never heard of until my good buddy Bookfoolery tapped me on the shoulder and said I'd like this collection of stories. Boy, was she right on! The blurb at Goodreads was just too good not to rip off. I mean, really, these stories are very thinky and thematic and odd and out there. It's what Scheer does with the oddities that really illuminates this collection. To say a collection is about "our body becoming alien" sounds sort of ridiculous and pretentious, but it's absolutely true. Even if you're never grappled with issues as serious as cancer or military deployment or any of the other struggles in this collection, maybe your body felt alien to you if you hurt yourself or you've dealt with an illness that made you feel a bit betrayed or alien in your own skin. That's what Scheer achieves in this collection, and it's remarkable. My favorite story was called "No Monsters Here," in which a woman, who happens to have OCD and a husband who is deployed to the middle east, begins to find pieces of her husband's body around the house, beginning with an ear in the laundry hamper. It's not as grisly as it sounds...no blood or gore, just pieces of him. The secondary struggle in this story is the woman's OCD and whether or not to leave the comfort of her rituals which she feels safeguard her family, and let those habits go. It's an odd pairing, but the oddness of it really illuminates the struggle. Incendiary Girls is what I want when I read "odd" fiction. The weirdness doesn't exist for its own sake, but helps critique and expand upon everyday situations and struggles...both internal and external. Hm, I don't always "get" odd books so I'm not sure this collection is for me. I really liked this collection. Can't wait to see what Scheer comes up with next. Yep. Going on the list. You are murder on my list. Ooo, I love the sound of that story!! Just like Heather, it's going on the list! I'm not drawn to the "odd" so much though when I am I tend to really enjoy them. This sounds like an interesting one. The "No Monsters Here" story sounds very intriguing. You've made me curious! Um, the title itself would probably make me get this book - sounds fantastic!